popcorn wrote: The article overstates the combat radius of the C as 760 nautical miles. The combat radius of the F-35C is indeed overstated. The 760nm number is close to the SAR Baseline Development Estimate of 730nm mentioned in the 2010 SAR. The most current published estimate is 615nm, but this number is over a year old. Perhaps the method / parameters used to calculate range will be modified - like what was done with the F-35A - to increase the radius estimate somewhat. For reference, the SAR Baseline Development Estimate for the F-35B is 550nm, and the current published estimate is 469nm. Both numbers come from the same 2010 SAR. Using the current estimates from the 2010 SAR, the combat radius of the -C is about 25% greater than the -B. The 2011 SAR should be available (leaked?) shortly. "40. The F-35A is configured for "boom" refuelling and is therefore incompatible with the drogue-configured FSTA." I'd best ring round the rest of the A model customers and give them the bad news right this second I guess. No air to air refuelling for you guys, suckers! It's basically a re-iteration of the suggestion we bin the lot and buy F18 on the basis that F35 is $190 million a copy. spazsinbad wrote: Agree popcorn! Not certain if the ski jump has not already been removed from the first in class. I guess it can be done without if the ski jump can be added later in more cashed up times. Politics will decide the situation most likely rather than our good ideas. The ski-jump is bolted on to the flight deck instead actually being part of the bow, so adding it on is no big deal. stobiewan wrote: Ah, bless Mr Ward. The Standard F-35A is configured with a receptacle for USAF Boom. It can be ordered with the probe from the bravo and charlie models for export though. I know - it stands to reason that the A model would have to be available with the probe option or they'd never be able to export it - but there's Mr Ward claiming quite definitely otherwise. I'll file that under "USN carriers recover aircraft at 45 knots" I think. stobiewan wrote: I know - it stands to reason that the A model would have to be available with the probe option or they'd never be able to export it - but there's Mr Ward claiming quite definitely otherwise. I'll file that under "USN carriers recover aircraft at 45 knots" I think. No probe and drogue has never been much of a problem exporting the F16. Concerning the EPAF countries, pilots are trained in the US (except for Belgium). On missions they always operated where the US was flying as well. Concerning there own capabilities, no probe and droque, in case the F35, there is no problem. The Dutch ordered two KDC-10’s, boom system, in 1992 for the F16. On missions, together with Norway, Denmark or Belgium, these countries are able to use this boom system, without the assistance of allies or the US. Since 2012 the Dutch Royal Airforce has got 2 full flight simulators ( KDC-10 and Hercules C130) and does not have to train with simulators at Tampa or London anymore. As reported, it’s no problem for a country, when needed, to order probe and drogue for the F35A. Canada intends to order probe and drogue. Curious, in that case, both systems will be on board? o The project began in the 1980s and the Department was over-optimistic on costs. In particular, it failed to anticipate significant cost increases and delays from the rigid and complex collaborative arrangements. Overall, it is costing the Department £20.2 billion, £3.5 billion more than it first expected, to buy a third fewer aircraft. This is equivalent to the purchase cost of each aircraft rising by 75%, from £72 million to £126 million. Suppose in case a developed aircraft carrier Typhoon would cost a hell a lot of money. 'bjr1028 said: "...The ski-jump is bolted on to the flight deck instead actually being part of the bow, so adding it on is no big deal..." Do you have a reference for that claim please? Thanks. F-35A >1,200 nm / 2,200 km; F-35B >900 nm / 1,667 km; F-35C >1,200 n.mi / 2,200 km"
And as 'stobiewan' says Mr.Sharkey is a tad careless with the facts - and as he points out sometimes hilariously so. I think one of the Canadian Air Refuel Drogue Brake Chute threads has an LM claim that there is space in the F-35A model airframe to install drogue/probe also but I think they state also that those requiring such a dual air refuel arrangement will have to pay for development etc. Last edited by spazsinbad on 17 Mar 2012, 20:26, edited 2 times in total. 1st503rdsgt wrote: Switching to the F-35C was nothing more than a short-sighted accounting stunt by the MoD to gain some short-term cost-savings that they could show on their books, a poor decision by bureaucrats with little understanding of the domino effect such a change would have on the costs of their entire carrier program. I think you're correct in saying it was a decision calculated to put some costs outside the life of the government - although given the delays in F35, it's now obvious that either model would still have been available too late to get into service on launch with the carriers. 25 knots would be plenty for F35C - it's KPP for wind over deck in most situations is alleged to be 15 knots. It's possible in some very odd circumstances (very heavy weapons and fuel loads plus total calm and an urgent need to recover that precluded simply dumping fuel) that CVF would have to pour on the coals but I'm pressed to think of anything that would cause a major problem. There was nothing wrong with the concept of building a large, capable STOVL carrier - CVF was always intended to be converted to CATOBAR at some point in their lives, and 65Kt was about the right size to support a reasonable air wing of any sort with enough fuel and munitions to pound the snot out of most third and more than a few second world countries without breaking sweat. There's no way CVS could have soldiered on with F35B on the decks - they were too small and needed replacement. I think if we'd realised what a total clusterf*ck the actual procurement would have been, we might have been better off going for three 40Kt CVS replacements but that's hindsight. They'll be fine ships in service and hopefully once we've got one in the water with aircraft flying off it, we'll all nationally breathe a bit easier. Can anybody enlighting this guy about the fuel consunption rate in lb/min in both modes for the JSF-35 (forget the B). Normal flight and in afterburner. I know there will be many variable possible but we should be able to come up with some kind of an avareege. Also what would or could it have been for the other engine that was stopped dead in its tracks. 'popcorn' asked: "...I need clarification though on what roe the RAF will play, if any, when the F-35 is acquired. Will they jointly operate the jet along with the RN?" "...Even the RAF seems to have reconciled itself to the fact that Carrier Strike will happen, and has agreed that the manning of the F-35C squadrons will be shared 60:40 with the Fleet Air Arm. The problem now is to buy enough F-35C’s to form the three front-line squadrons of 12 aircraft that are needed to fill the decks of a QE in a crisis, and for once the RN and RAF will present a unified front!" Thanks, was curious about a dual refueling capability. A dual refueling capability seems to me, operational, quite an advantage. Drag chute installation … multi-national development beginning soon? Some particular countries are known? Thought Norway seemed not interested anymore? Yes, but two of the major partners in the program fly CF-18 and SuperHornets (Canada and Australia) which would mean that no probe arrangements would kick those two in the nuts. As you say, any former F16 customer buying 'em in will be status quo. Actually, if they wanted, it looks like they're one up with the A model as you can apparently (according to that spiffing slide Spudman just posted) have both. This is what I mean about Ward - it's blindingly obvious that a probe would have to be an option for the A model but he doesn't even check his facts before posting. Honestly..
Airbus Military Aerial Refuelling Boom System (ARBS) for receptacle-equipped receiver aircraft. Cobham 905E under-wing refuelling pods for probe-equipped receiver aircraft. Universal Aerial Refuelling Receptacle System Installation (UARRSI) for self-refuelling." "The refueling aircraft for the Royal Australian Air Force (RAAF) will be equipped with both an Aerial Refuelling Boom System (ARBS) and two Cobham 905E under-wing refuelling pods." Since the A was designed from the beginning (at least post SWAT) to have a dual-fueling capability and that all Partner nations are part of the JPO and therefore have access to all the info therein, Canada has known from the beginning that this ability existed. 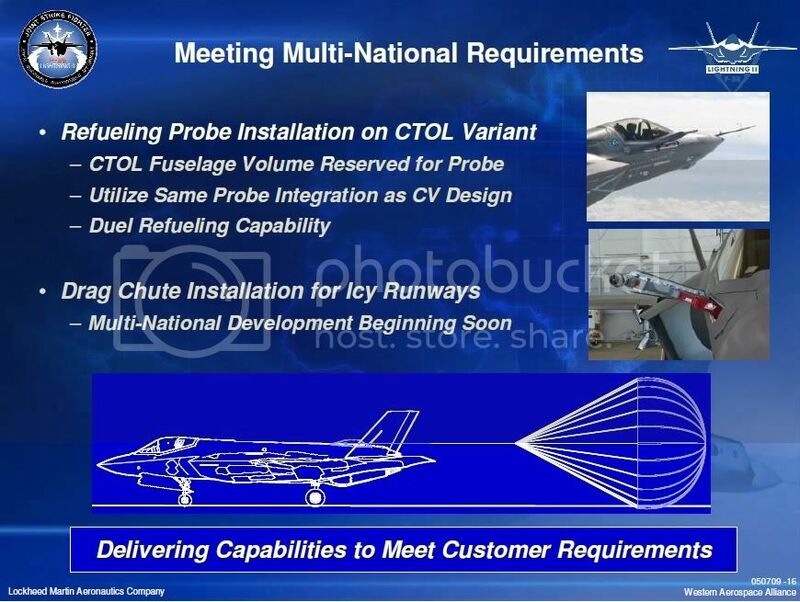 The slide above was from a PUBLIC presentation in May of 2009 given by Keith P. Knotts (F-35 International Business Development).